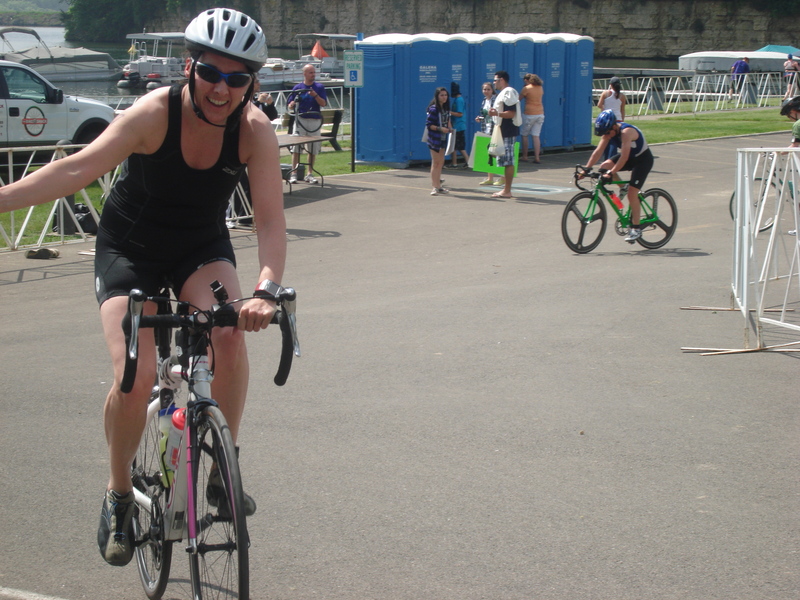 Well, it has taken me a while to get around to writing about my first triathlon experience. As a result, there has been some speculation that perhaps I drowned during the swim. I can assure you, any such rumors about my demise are completely false. Yes, at one point in the swim I wondered if I might drown, but fortunately I did not. I lived to tell the tale. I even liked it. I am not sure why it has taken me so long to sit down and write about the experience, however. Perhaps after coming off the rich mine of stories from our trip to Laos and Vietnam, the triathlon seems a bit bland in comparison. It is hard to top babies bouncing off the back of crashing motorbikes, after all. But the triathlon was a singular experience for me. As my fabulous coach Nina said, you never forget your first time. I am quite sure it is true. Yet it is hard for me to capture the feeling of the event. Although there were moments when I was thoroughly enjoying myself, to say that the event as a whole was “fun” wouldn’t be true. Parts of it were most assuredly not fun. In fact, when we arrived in Galena the night before the triathlon and I felt the water, I knew “fun” would not be a word I could ever use to describe the swim portion. The water was, as expected, painfully cold. In addition, it didn’t smell very appealing. I looked around and saw a film of algae off to the side. The algae was not covering the starting point of the triathlon, but it was not far away either. I also saw several geese swimming in the lake. And you know what that means: goose poop. On the bright side, I had just gotten over an intestinal parasite, so if I picked up another one from swimming in the poop-infested waters, at least I would recognize the symptoms pretty quickly. And I have discovered that an intestinal parasite is a very effective weight loss tool. Disclaimer: I would not recommend intentionally getting a parasite. However, if I picked up another one, I knew there would be the drop-five-pounds-fast silver lining, a nice side bonus, even if it is rather disgusting to contemplate. Luckily, after I managed to immerse myself for my pre-race swim, the water did not seem to be Oh-My-God-I-Think-I-Am-Having-A-Heart-Attack cold. It was just Damn Cold. Which is good, because otherwise I might have burst into tears. I wrapped up my pre-race swim (to call it a “warm up” would be ridiculous, since I was shivering), and then I stood on the beach waiting for my wave to start. I reviewed my race plan in my head. The swim plan had three major components 1) don’t drown, 2) try very hard to get to the finish, and 3) don’t just cling to the buoy for dear life and scream for help. Before I knew it, the horn sounded and we were off! I ran down the beach and into the water, letting the vast majority of my start group go ahead of me. Somewhat reluctantly, with a longing glance back towards the warm safety of the sandy beach, I dove in. It was like someone had turned out the lights. I popped my head back above water: daylight! I put my head back in the water: night. Daylight! Night. Daylight! Night. I realized the swimming-with-the-eyes-closed technique was going to come in handy. I took a deep breathe (ignoring the funky smell) and put my head in the water. I paddled along and made it to the first buoy pretty quickly. I reviewed point number 3 of the race plan and avoided the temptation to grab the buoy and yell for help. I made the turn towards buoy number two. As I did so, I paused for a moment to get my bearings and had one thought: “that buoy is pretty damn far away.” I started to wonder if I could make it. The water was freezing and murky, I was tense and not making much forward progress. Fortunately, the water started to clear a little and I could vaguely see the feet of the woman swimming in front of me. Just follow her, I thought, and pray that she knows where the heck she is going. Finally, we rounded the second buoy, and for the first time in the swim, I began to relax a little. The likelihood of my drowning seemed to be decreasing, and I had finally adjusted fully to the water temperature. With a surge of optimism, I paddled along, getting to the beach well behind most of the other people from my start group. But who cared? I was alive! I stopped for a moment to kiss the sand (kidding, although it would have been a fitting thing to do), and I proceeded towards the transition zone to get my bike. I was plagued by indecision in the transition zone. Gloves or no gloves? Socks or no socks? Jacket or no jacket? I was so happy to be done with the swim that I couldn’t even think straight. Finally, I realized I was burning time, so I just grabbed my bike and went (no socks, no jacket, no gloves). I gave my kids and husband a high five as I passed by them and started to ride up the first hill. I rode like a 12 year old who just got a new bike – with unabashed joy. After a few miles of my I’m-so-thankful-I-didn’t -drown giddiness, it finally occurred to me that I was going rather slowly. I could probably pick it up a little, but it seemed rude to pass all those other riders. Then I remembered it was a race, passing was what you were supposed to do. So, I started to move ahead and proceeded to pass every rider I could see. With the possible exception of riding on Cat Ba island in Vietnam, it was the best bike ride I’ve ever had. It was clearly marked, the roads were closed to cars, there were great hills, the weather was perfect, and above all, I did not have to get back in that damn lake again. I was happy as a clam. I coasted into the second transition zone realizing that no one had passed me during the entire 17 mile ride. Of course, I gave back a ton of time on the run, but I never claimed to be a fast runner. I was just enjoying the scenery and the camaraderie on the course. I ran the last part of the run with a guy named Mark. We were running roughly the same pace, but he kept walking up all the hills, where I would pass him. Then he would pick up speed on the downhills and pass me. It was like we were playing a cat and mouse game, so it got to be a bit of a joke. Once the course flattened out, he was kind enough to stay with me for a while. It turns out he has completed 22 marathons. I lost him in the last half mile, but Mark, whoever you are, thank you for helping me get from mile 2 to mile 4. Are you going to be doing this workout crap while you are in Montana? Because my deal is about facials and lunch this summer. I hope we can still be friends. Because I’d like to be friends, but not if you’re still doing all that workout crap. I thought we were going to do Ironman training together. I even started referring to this summer as Iron Summer (not Ironing Summer, since in Montana you can get away with a few wrinkles). But if you want it to be Facial and Lunch summer we could probably do that instead. However, I will need a note from your doctor.